Optical rain sensor uses the principle of light refraction using IR lights. 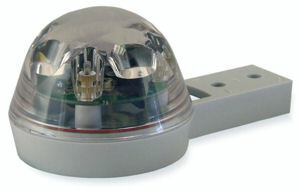 The IR light is internally reflected by the top clear dome cover. When the water gets on the surface, some of the lights gets refracted out. Less light gets reflected internally. The reduced in the intensity detected indicates the presence of water. Buy optical rain sensor online here. 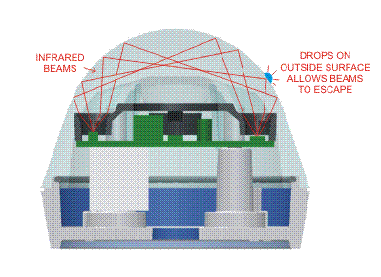 In a rain detection configuration mode, the rain sensor will be activated (dry contact relay will be triggered) when there is rainwater activity on the surface of the clear plastic dome. When the rain activity is stopped, the sensor will remain activated for about 2-3 minutes before it will deactivate and release the relay contact. This time period can be extended by 15 minutes if you do not want the sensor to release the relay contact too soon. Click here to check out this rain sensor product page for the complete details and description. Simple to install and simple to deploy on site. Rain Sensor is available in Singapore. This product is also available in Malaysia, Thailand and Indonesia (South East Asia). Please contact us for further information. The sensor provides a connector of 5 terminals to allow you to connect your power supply to the electronics inside the sensor. Before you can access to the sensor electronic board, you will need to open the casing. Underneath the optical casing, there are 4 holding screws. 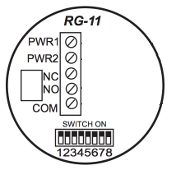 The PWR1 & PWR2 is the power supply input terminal. There is no polarity to the terminal, you can connect the positive/negative power supply wire either way. For a standard, you may prefer to connect the +ve to PWR1, -ve to PWR2. You can power up the sensor with Vdc or Vac supply. The NC, NO, COM is a relay output. When rain or water is detected, this relay output will be activated. NC refers to the normally close terminal, NO is the normally open. COM is the common terminal of the relay. This equivalent schematic on the left illustration a simplified version of the rain sensor interface. There is also a green LED in the middle of the circuit facing outward through the optically transparent cover. It will light up when the sensor detects rain/water, or when the relay is activated. [1 2 3 4 5 6 7 8] DIP Switch No. 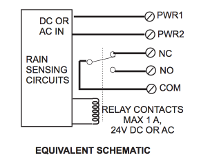 Check out this rain sensor online guide for more operating mode configuration settings on the DIP switch. Note: This product does not come with its own power supply. You can tap the power from your existing power supply, or purchase a 230Vac to 12Vdc power adapter to power up this rain sensor. How optical rain sensor works? Click here for some details of how optical rain sensor works. 1 Year Local Support & Warranty. Check out this page to compare the other types of rain-water sensor.